Machine to instantly batch freezing of ice creams and sorbets. 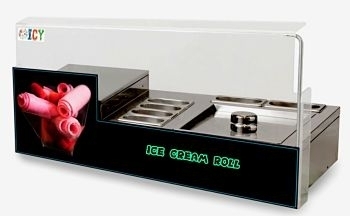 ROLLED ICE CREAM MACHINE is a machine that has a system capable of maintaining a temperature at - 20 degrees which freezes very instantly just within 15 seconds and you get rolled ice cream ready in just 30 seconds. Thanks to the new concept provided by ICY ‘s RD dept. You can add more cream or chocolate chips, fruit or praline to garnish and creative new dishes. In addition to the ice cream it is also possible to prepare fruit sorbets or alcohol-based depending on your imagination. Rolled ice cream is composed by a plate, a rolling tool for the preparation semi frozen sweet flavours. You can serve Rolled ICE CREAM with coffee, fresh fruit, dry fruits, parmesan, biscuits and crackers. Just not only these, you can offer delicious cocktails in the form of rolled-up ice-cream, such as Spritz, Campari, Mojito, Negroni or champagne, prosecco, amarone, etc. ICY Mak Sti came int business in 1987. Our company was specializes in the sale, service and installation of refrigerated displays, refrigeration equipment, ice cream equipments and air conditioning . Over the years our mission diverted to ice cream equipments due to excessive developments within ice cream industry by emerge of various concepts like frozen yogurt and smoothies etc..